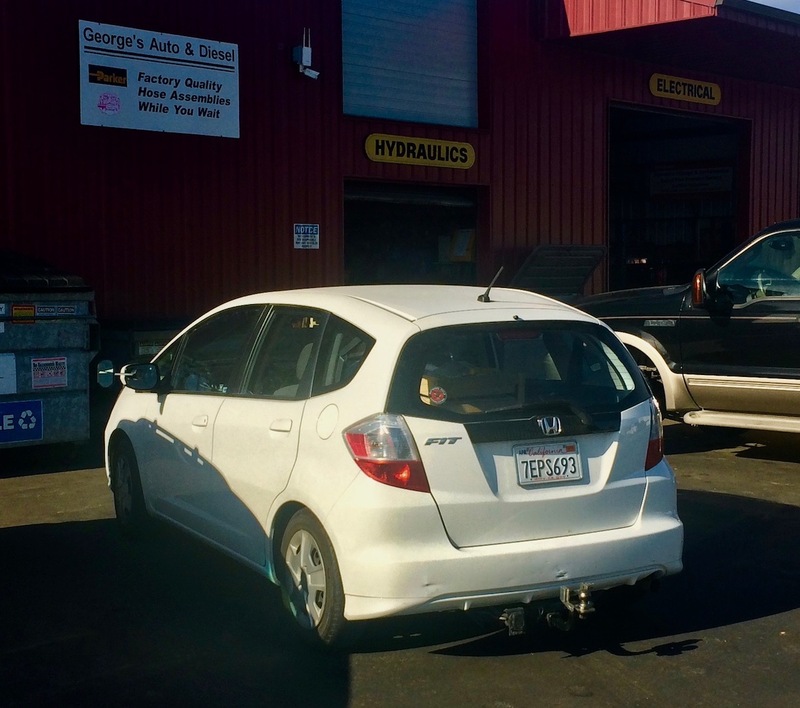 8am - Little Honda has gone to George's for service. Change oil. Lube job. Also to check to see if anything else needs work. 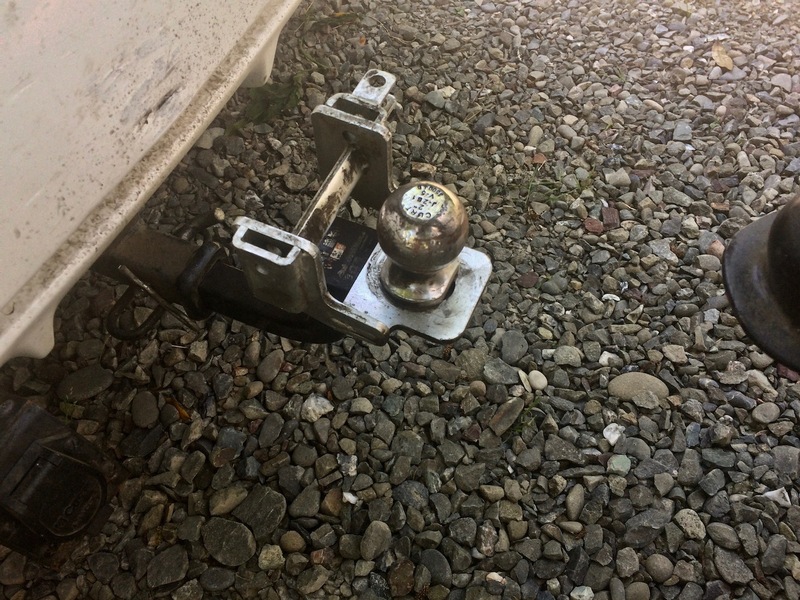 We especially want to take a look at the condition of Honda's trailer hitch. Just to make sure that all is well. Inspection of the forward part of the hitch showed that Honda is broken. The Hitch is able to move up and down!!! This is bad. Very, very bad! We are taking Honda to Two Guy's Automotive. A welding shop. To learn if this break may be welded. 10:15am - Honda to be fixed! Little Honda now has appointment at Two Guy's for Friday, June 2nd at 3pm. We are very, very lucky because the broken part of the Unibody is able to be repaired! 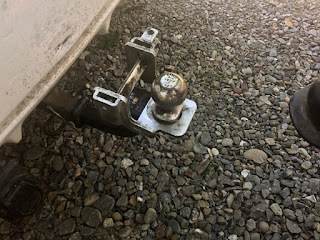 The forward part of the hitch has two bolts which connect to Honda's Unibody trunk pan. 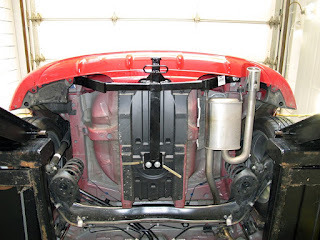 The Unibody is cracked just above where the forward part of the hitch connects to that trunk pan. This is all very hard to describe. 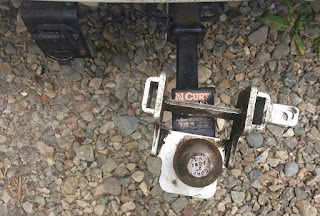 So, we found a video which shows how this hitch is mounted. Click [Here] to watch this installation video. We also have a pic of our hitch as installed into a Honda FIT. 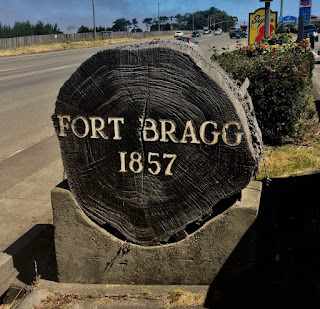 We have several things to do while we Camp in Crescent City. Our Honda welding repair appointment is over two days away. So, we have plenty of time. 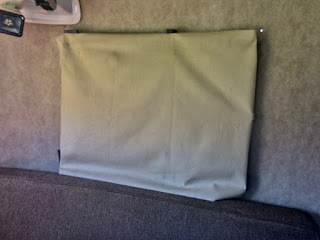 Our first project to attend to is yet another revision of Scampy's stealth curtains. This time Scampy's windows are being "blacked out" with Premium Poster Board purchased from WalMart yesterday. Well, only one more window left to cover with Black Poster Board. 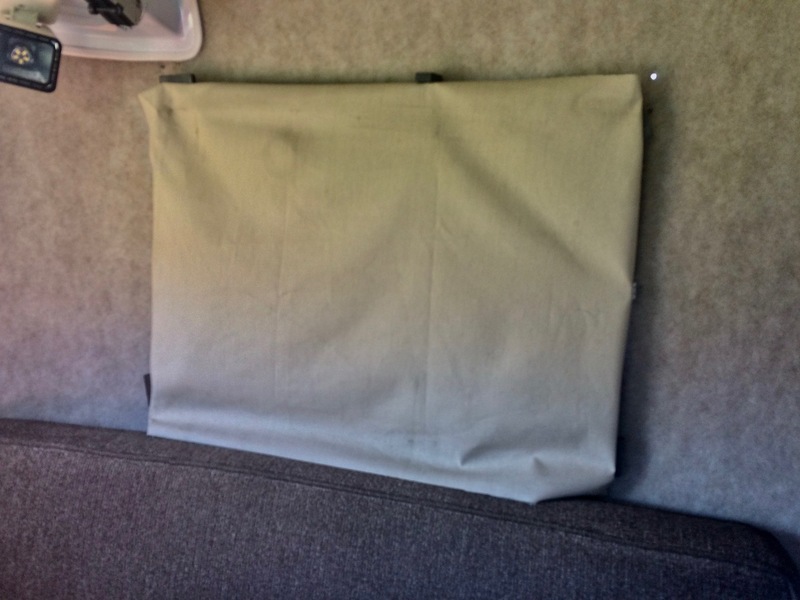 The large window in Scampy's rear wall is going to remain covered using black-out fabric so that we may lift the fabric when Boid and George want to to look outside. Also, to let the sunshine in! This fabric is held in place using strong ceramic magnets! It seems that I am about to take the plunge into digital currency. Because I wish to begin buying and selling stuff without using the US dollar in order to familiarize myself with how it works. 6:15am - Every morning in Scampy is delightfully the same. First, we turn on iPhone music because Baby Boid likes to wake up to music. Usually, Johnny Mathis because his music is so mellow. Then we remove Boid's black cloth cage cover. Next, we change our bed to a table with bench seats. By the way, our bed is very comfortable. Just firm enough. Two pillows. All of our bedding, sleeping bag and pillows, gets stored in the big cabinet next to Scampy's door. 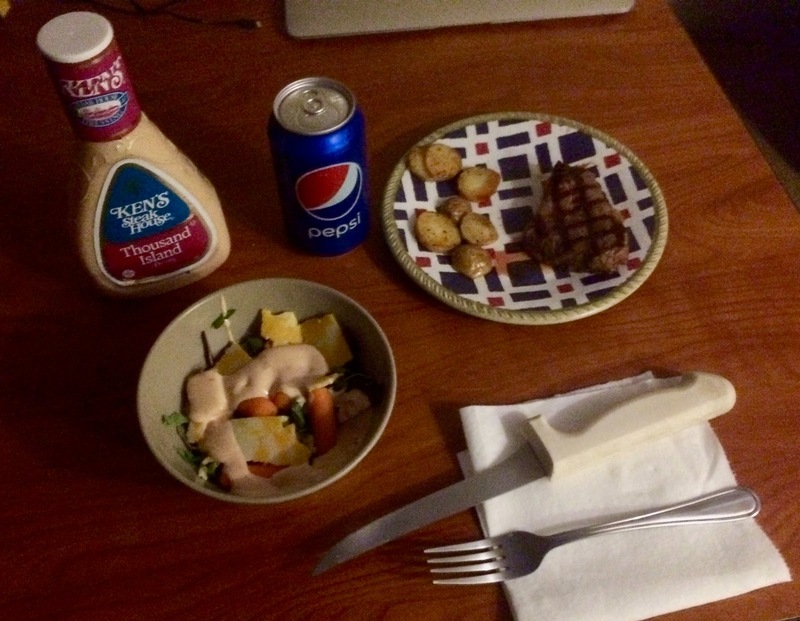 It only takes us about two minutes to convert our bed to table. Then we change Boid's seeds. Hartz Bonanza Parakeet Diet. Health and Vitality Blend. Only the best for Baby Boid! Change his water. Change the paper towel at the cage bottom. Then George gets dressed. Long pants and long sleeve shirt when the morning is cool. Short sleeve shirt and short pants if it is warm. This morning in the City of Eureka, the temperature is 52℉. So, we are leaving Wave3, our catalytic heater on low in order to be comfortable. George's morning things consist of shaving, brushing teeth, taking his vitamins. Then preparing breakfast. This morning no breakfast was prepared. Good thing, too! Because we went out for breakfast. 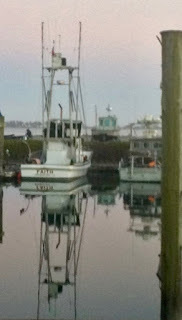 We went to the marina here in Eureka just for a look-see. 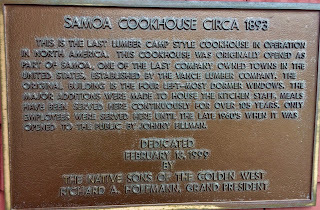 On the way, we spotted a sign for the Samoa Cookhouse! We had forgotten about the Samoa Cookhouse. The first time here was in 2003 when MsTioga's transmission was replaced at Harper Ford. 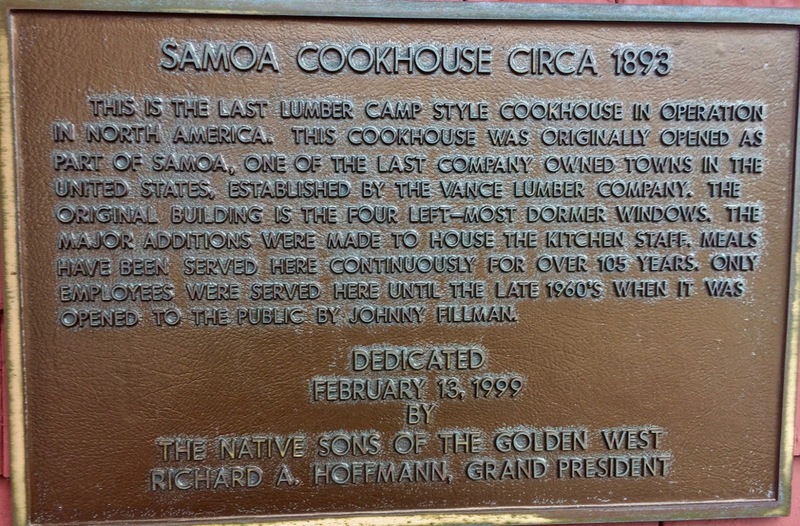 The Samoa Cookhouse is from the olden days when lumber camps were huge operations. Little iPhone captured an elk herd in the vicinity of the Town of Trinidad! Wild Elk along today's journey! We have arrived in Crescent City. In 2006, MsTioga and I Nite Camped here. Click [Here] to view that Blog post. We don't use our past Blog posts to locate a present day Nite Camp. But we decided to do it today, just to see how difficult it would be to find the exact location of that August 20, 2006 Nite Camp. And guess what? We found it using a Google Map on Little iPhone! We moved from the site of our August, 2006 Nite Camp so that neighbors would not be alerted that an RV was in their neighborhood. The plan was to return later to that site for our Nite Camp. However, the place where we moved to appeared to also be good for our Nite Camp. So, we remained there and began to prepare supper. 9:45am - It's kinda a nostalgic morning. One by one, all the working folks head out from the Park. All going back to their homes. Of course, we on the Scampy RV Team, are always home. 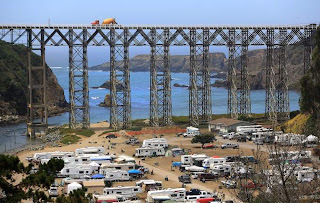 Our last day at "Giant Redwoods RV & Camp Destination" is tomorrow. When I meet RVers who have Blogs, I save their URL in my BookMarks Manager. Every so often it's nice to take a look at what is going on? Today I went to take a look at the Blogs on my list. Some of them are gone completely. Their URLs are parked. Who knows what happened? Some just do not Blog anymore? 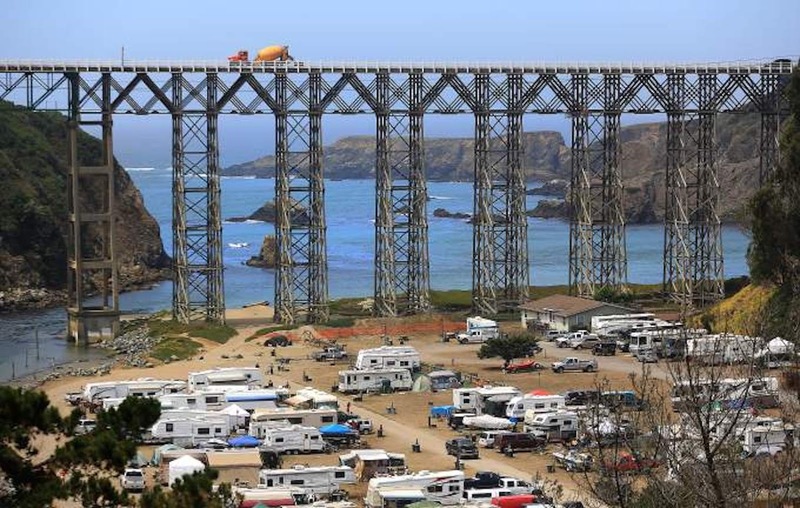 Do you know what happened to these RVers? All of a sudden, the Scampy RV Team knew it was time to hit the road. Sometimes we just get that feeling. Don't know why? It's just time! So, one day early we headed on out. We have arrived in the City of Eureka. In our Dometic fridge, we have burger patties. We also have Jewish rye bread. 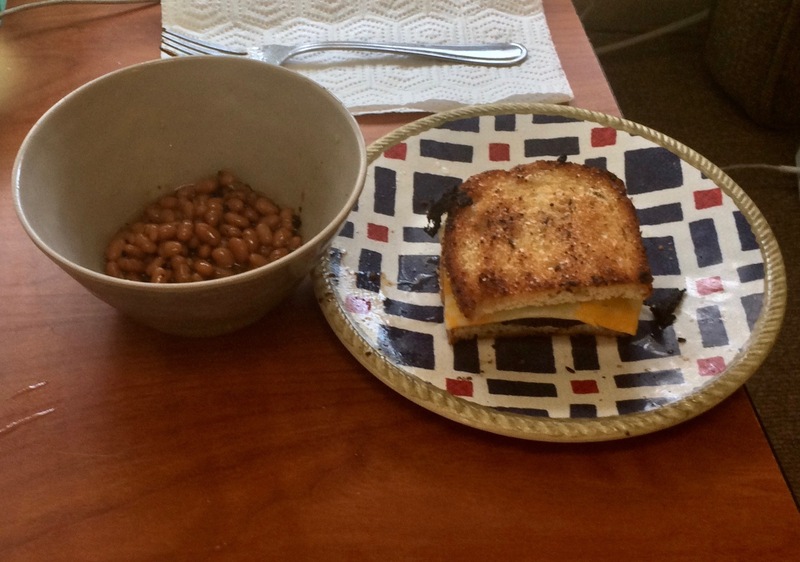 So, we are going to prepare a Patty Melt with a side of baked beans. Only thing is, our King BBQ lighter would not light Scampy's range top! No problem, we have two Coleman BBQ lighters in reserve. Guess what? Neither of the Coleman lighters would start!! We have decided to make our Nite Camp in the lot behind the Les Schwab Tire Center in the City of Eureka. Recently, we made a Nite Camp behind a Schwab Tire place and were not disturbed. So, we are giving Schwab another go. 10am - I've been extremely fortunate to meet such nice people at this RV Park. Two couples. Each couple in their own RV. Scampy made her Camp just across the park road from them. It has been very good thing for me to learn that these folks have sooooo much in common with myself! Just today I got approval for my application to Scamp Owners International. As you may imagine, this is an organization composed of Scamp trailer owners. 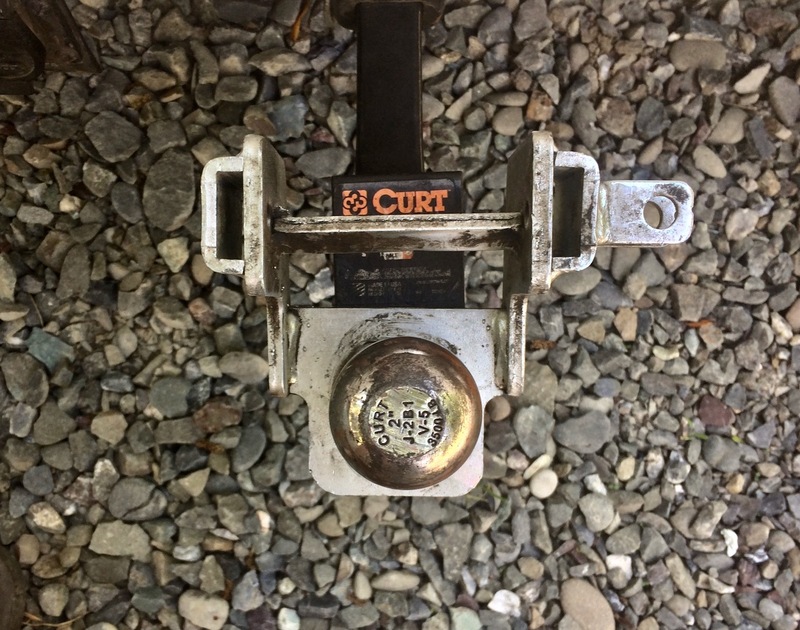 I've spent a few hours today going over topics in order to know what other Scamp owners are doing to keep their trailers in top condition. PS: We are doing various tweaking things on Scampy. 1. 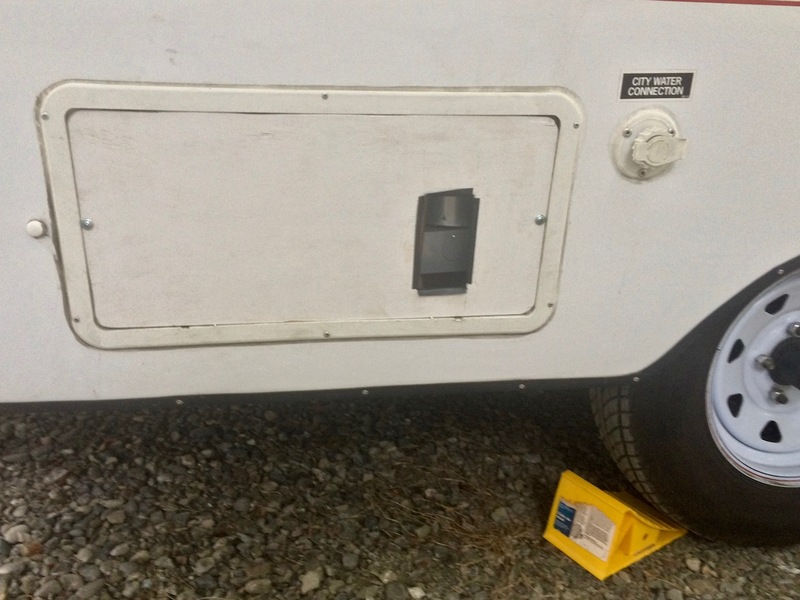 Testing how our Dometic fridge will do using 120 volt AC power. 2. 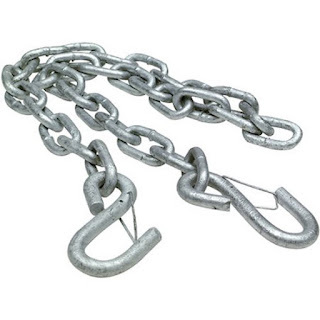 Considering changing Scampy's hitch safety chain so that the hook has a spring keeper. Presently, the hook is threaded back on itself and attached to the chain to keep from coming loose. 6:15pm - The Big Chair! 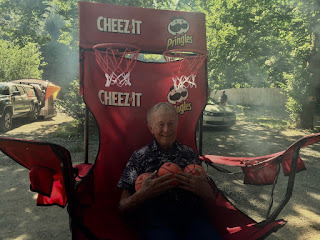 Who is this Big Chair guy anyway? 7:30am - Do you recall when our Dometic's exterior vent panel was destroyed? I attempted to buy a new panel from Amazon. But UPS lost the package. And since I was leaving on my present trip, I never reordered that panel. What I did do, was to fabricate a panel cover out of 1/4" plywood. That wood panel had an access hole designed to be able to restart the burner flame without having to remove the panel. However, I soon learned that there was not enough air flow thru that little access hole. The Dometic would not cool down. So, I abandoned the wood panel idea. That left all of Dometic's controls, burner assembly, tubing, etc., exposed. And all of that was kind of ugly. It embarrassed me. So, a couple of days ago I gave the wood panel cover another try. But this time the panel was rotated so that the access hole was in front of the burner [The burner is on the right side]. Yesterday, Scampy was towed many miles with the wood panel in place. And guess what happened? The burner did NOT go out! PS: This Blog post is kinda long-winded! But I was sooooo excited about the burner flame not going out when Scampy traveled, that I wanted you to know about that! I got an invitation to supper last nite. 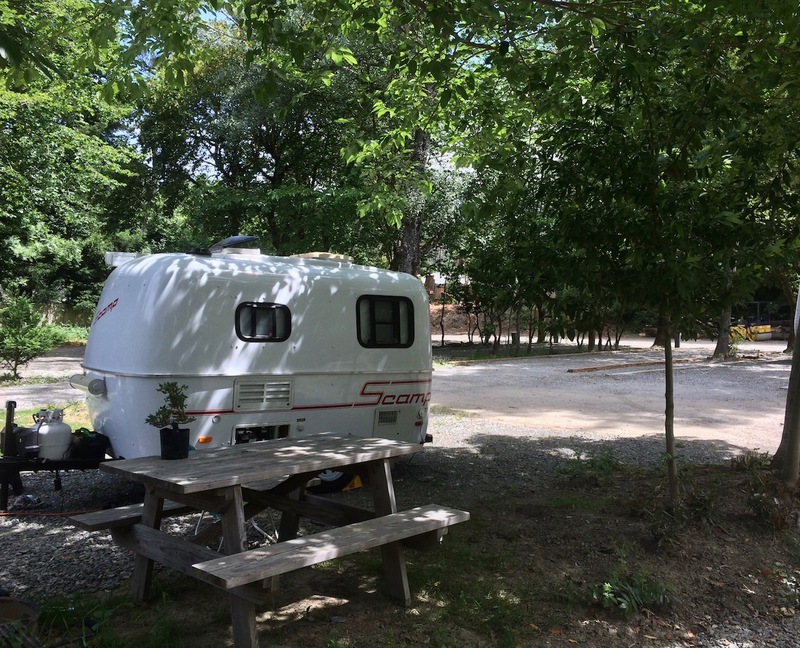 There are two nearby RVs in the park occupied by two married couples who are long-time friends with each other. On the menu, pork burgers. Very good burgers too! Very nice people. I enjoyed talking with them. Earlier in the day, we had a really interesting discussion about historical events. From the time of Moses all the way to the American Civil War! 7am - I'm concerned because the DuraSafe hitch guide has rotated [Link]. I don't understand how this rotation could have happened? The installer did not use a torque wrench on the ball's nut. Could that be it? Note: It is now 4pm. Below we have labeled the pics, Before and After. About noon today, we went to a shop in the Town of Redway, and the ball to hitch relationship was corrected. 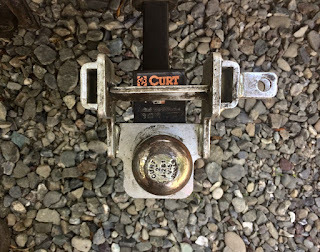 When I read Reader Croft's comment, I went out to take a look at the hitch again. That's when I noticed that the hitch guide's bracket does not appear to be installed correctly. View the pic below. 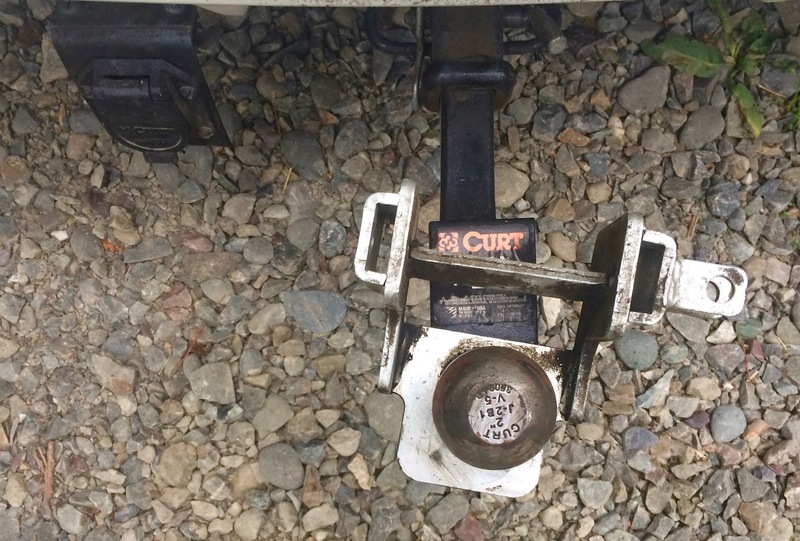 The bottom of the hitch ball is sort of hanging over the elongated hole in the hitch guide bracket. 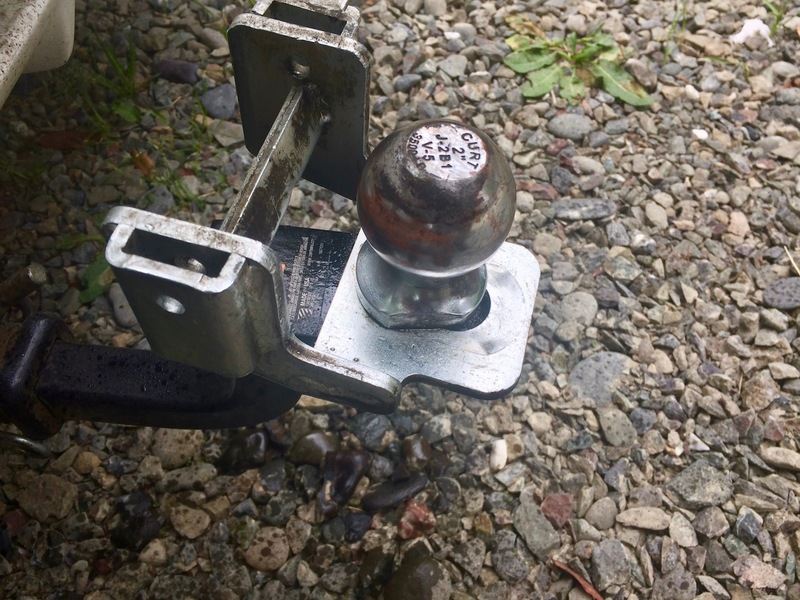 The hitch ball should be rotated so that the mating surface of the ball has maximum contact with the guide. 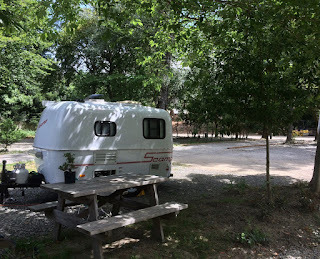 This afternoon the Scampy RV Team visited the location at the South Fork Eel River where Tioga and George got stuck in the gravel. AND, spoiled Tioga's transmission. That was back in our first year RVing in 2003! Click [Here] to read about that day in the life of MsTioga and her pal George. 10am - The Scampy RV Team has been spending quite a bit of time camping in RV parks. 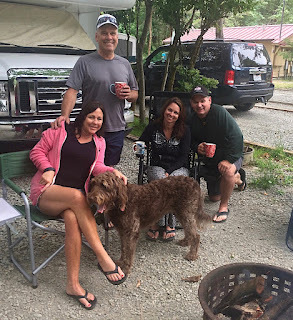 More time in RV Parks than Street Camping. This is easy living. No doubt about it! One of the items that really makes Park life easy, is shore power! We just plugged in our "BatteryMINDer Plus." This device is going to top off Scampy's deep cycle battery, and put the battery in top-notch condition. Also, with shore power, we are able to use our "CyberPower" electrical outlet. 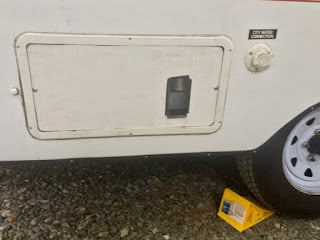 It has two 120 volt AC outlets. Also, two USB outlets. 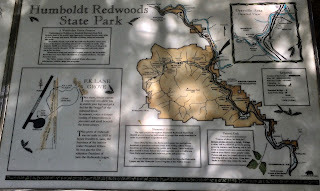 Little iPhone captured a pic of an info sign at the redwood grove that we visited yesterday. We are hoping that you will be able to enlarge this sign image enough to read it yourself. You may make the image larger or smaller with the use of the "View Pulldown" in your browser. Look for "Zoom In" and "Zoom Out." "Definitely! During the late afternoon when the shadows are long. And the light is still good." We went north looking at Redwoods. As you may know, there are a lot of Redwoods to look at in these parts! 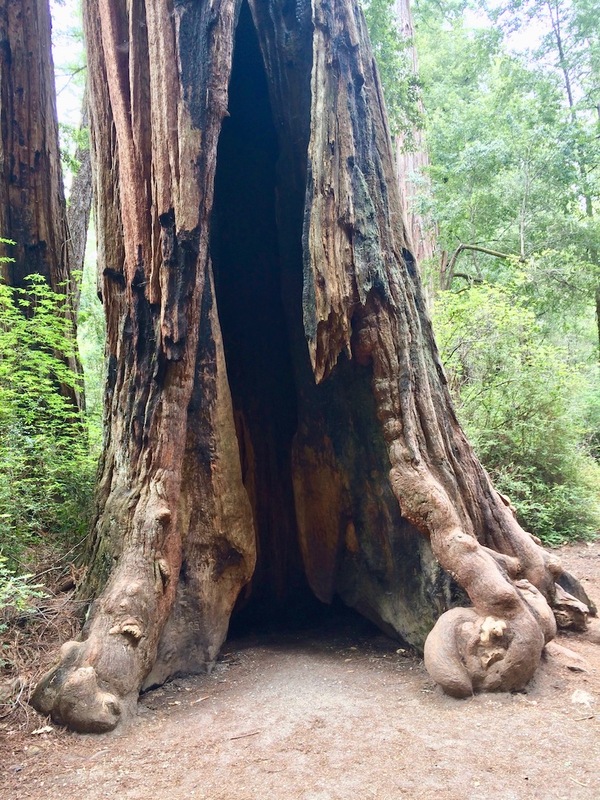 Little iPhone wanted to know hold old these Redwood trees are? "You can estimate the age of a tree without cutting it down and counting the growth rings. Most trees in this area of the country add about one inch to their circumference (around the tree) every year. If you divide the total circumference by one inch, you will have the tree's age." We on the Scampy RV Team are not stating that this age/measuring thing is true. Just what we read! Raviolis with ricotta cheese and spinach from Trader Joe's! 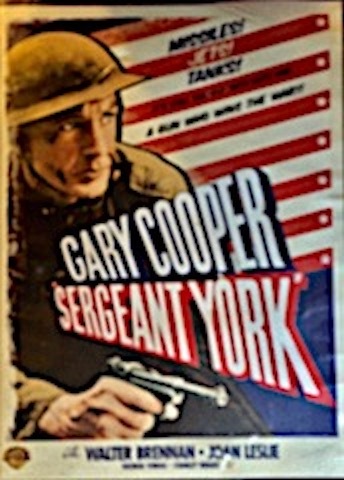 While supper was being prepared, we put on the movie, "Sergeant York" starring Gary Cooper as Alvin York. Also starring Walter Brennan as Pastor Rosier Pile. Joan Leslie as Gracie Williams [Alvin's sweetheart]. 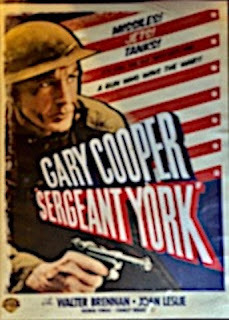 We love to watch movies about real people! 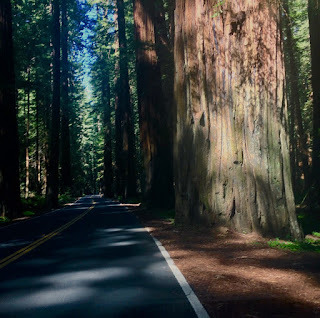 7am - Yesterday afternoon, the Scampy Team began to explore Avenue of the Giants, a road that is famous for the huge redwood trees along its length. We became concerned about where we would find a place to Nite Camp. It was after 4pm and here we were at the beginning of the Avenue of the Giants road! Little iPhone spotted a nearby RV park named Giant Redwoods RV Park. We drove over there believing that this park would be completely booked. However, when we asked at the office, we were told that just a few minutes ago, a cancellation was received!! If we had arrived a few minutes earlier, we would been told that there was no space available for us! We are staying here at the Park thru Memorial Day holiday. 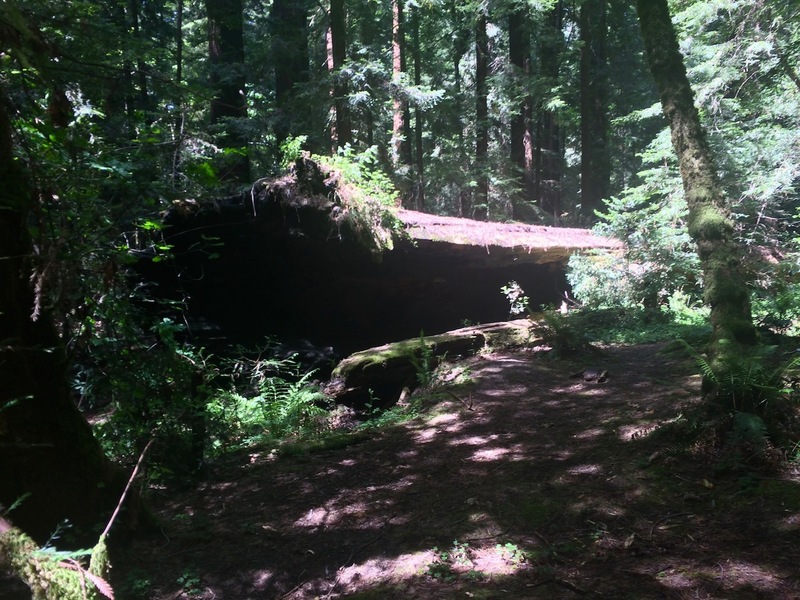 With an entire week available, we will be able to completely explore this giant redwood tree forest! During the last part of yesterday's journey, Scampy must have been seriously bumped! When we arrived at Giant Redwoods RV Park, Scampy's door was open. This had never happened before. When we went to prepare supper, our frypan was missing. We figure that when we went over that bump that opened Scampy's door, the cabinet which contained the frypan opened up. The frypan must have toppled to floor and then bounced to the outside. This morning we went to an Ace Hardware in the Town of Redway and bought a new frypan. 1. Click image to enlarge. Use your browser's view pulldown to Zoom In or Zoom Out. 2. 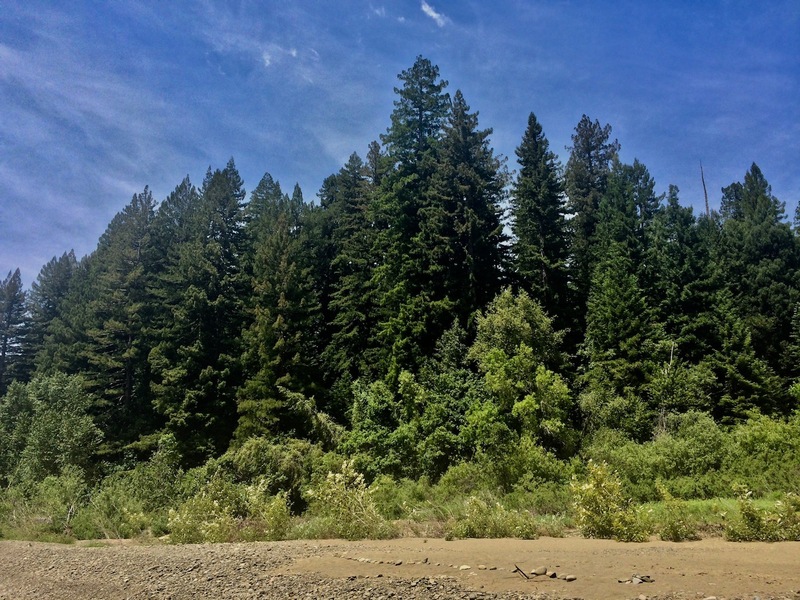 The South Fork Eel River flows just a few feet away from Giant Redwoods RV Park. 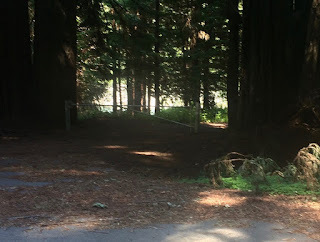 RV park, we drove to the southern most grove. It's named, "Franklin K. Lane Grove." Pretty quick we figured out that there are really no groves of redwood trees. 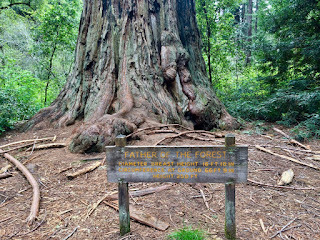 The truth is, that redwood trees are growing all over the forest in this area. So, what is a "grove?" The answer to this question is, that a grove is part of the forest that is given the name of somebody who is honored by the tree lovers. Tourists flock to these "so-called" groves. These tourists fool themselves into believing that the grove they trudge thru is special. It's not! Little iPhone and George trudged down to the South Fork of the Eel River. Looking back at the forest, we could see tons of redwood trees. 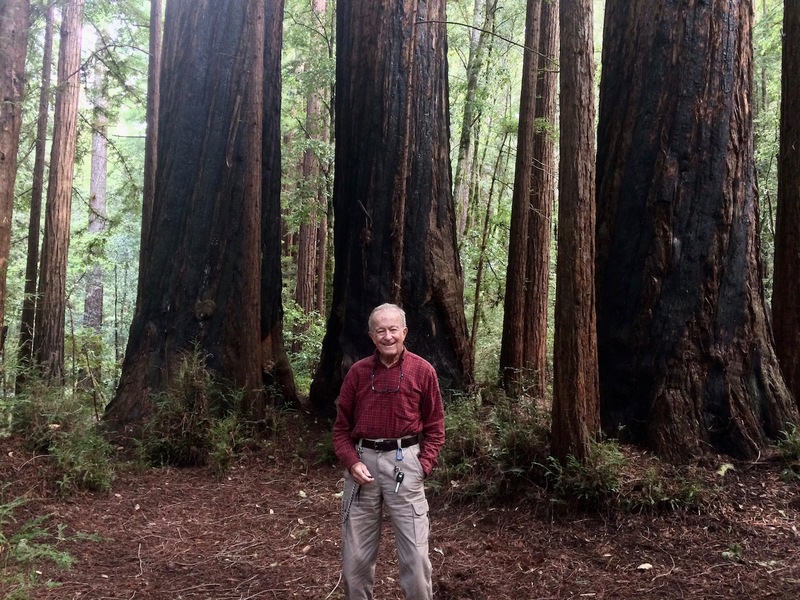 In the pic below, the tallest trees are all redwoods. 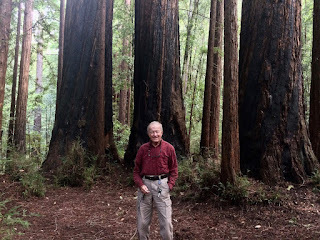 There are sooooo many redwood trees in this pic! Amazing! The tree in this pic sprouted as a seedling on April 1, 1734. 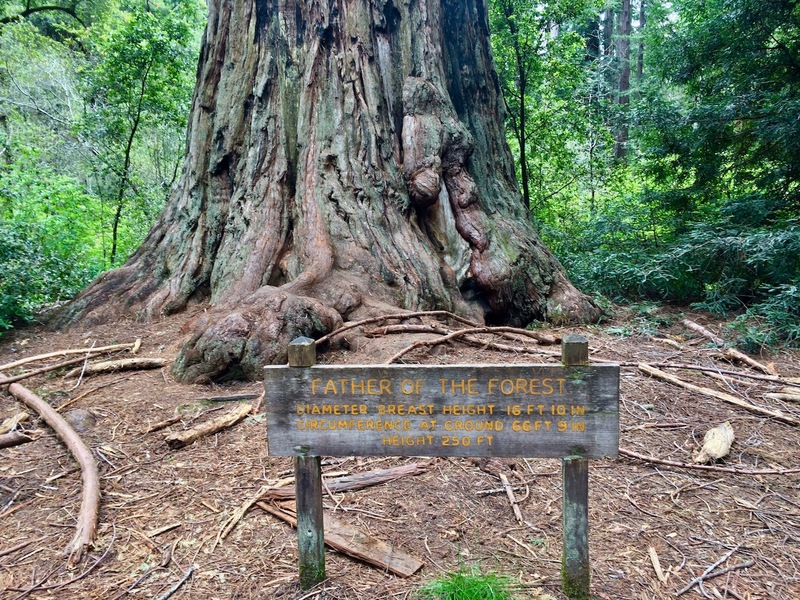 On February 7, 1876, a raging fire seriously damaged the tree. During the morning of December 17, 1907, high winds toppled the tree. "Now that you've been camping for a while with Scampy, how do you feel about having a trailer vs a motorhome?" I've been thinking about Bill's question since I read it. And my reply to Bill would be different then my comment/reply to him. It seems to me that the ideal RV setup for me would be a 4-wheel drive pickup truck with a small camper. With this RV setup, traveling into the forest over dirt roads would be easy to do. Scampy and Honda have very small clearance which would be a disaster in a forest. Also, Honda has front wheel drive, which does not perform well on dirt roads. The Scampy/Honda setup is good for pavement driving only. It appears that the Kruse Rhododendron Preserve is not open for viewing. We found a closed gate with an arcane communication device. Could not talk to anybody there. We tried phoning. Could not get the phone to ring? Do you know what goes on here? Eating - Where and how? 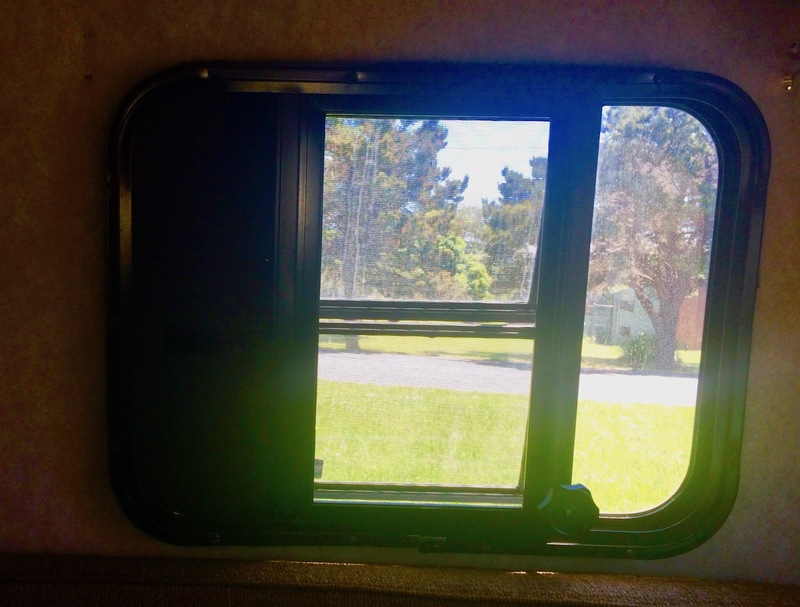 You may have wondered about eating [food preparation] here on the Scampy RV Team? When George gets hungry, we find a nice place to make our meals. This morning for breakfast we pulled over in a pull-out of Hwy #1, about 100 yards from the Ocean. It was a bit chilly inside Scampy, so we cranked up Wave3 [catalytic heater]. This morning we decided on Smoked, Apple Chardonnay Chicken Sausage [from Trader Joe's]. Also, matzoh and eggs. We like matzoh and eggs instead of plain scrambled eggs. 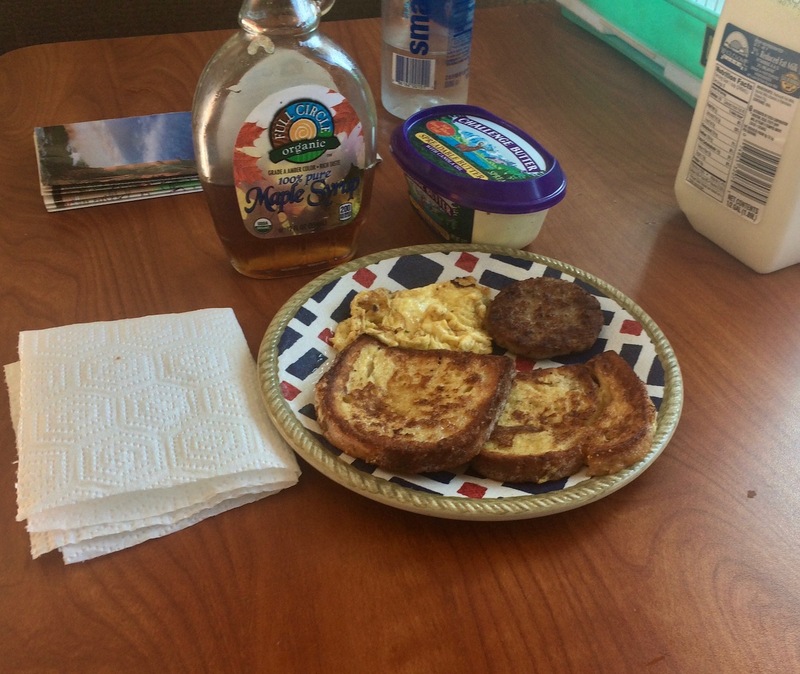 The matzoh in the eggs is balanced [carbs]. This morning cranberry juice was our drink. Cleaning up after preparing a meal in Scampy is pretty easy. We have soapy water in a bowl which we use with a hand-held brush. After each item is washed and rinsed, we dry it with a cloth towel and put it away in its place. 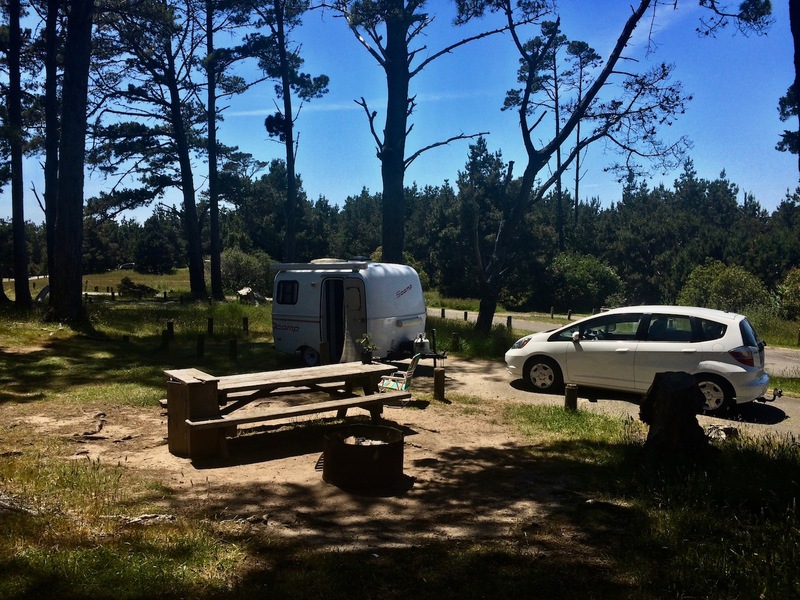 When MsTioga and I were RVing together, we Camped alongside the Gualala River. 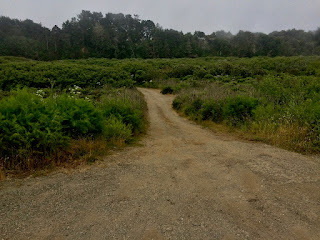 So, when we reached the road to that Camp, iPhone and I went over to take a look at the road's entrance. As soon as we saw what Honda would be challenged with when leaving that Camp, it was clear that this was a NoGo! Honda would not be able to tow Scampy up that sandy road. Honda's tires would not hold traction here. The pic below does not do justice to the steepness of the road. We arrived at an Ocean access road that looked interesting. The road led to Manchester State Park. A dirt path from the parking area led toward the Ocean. 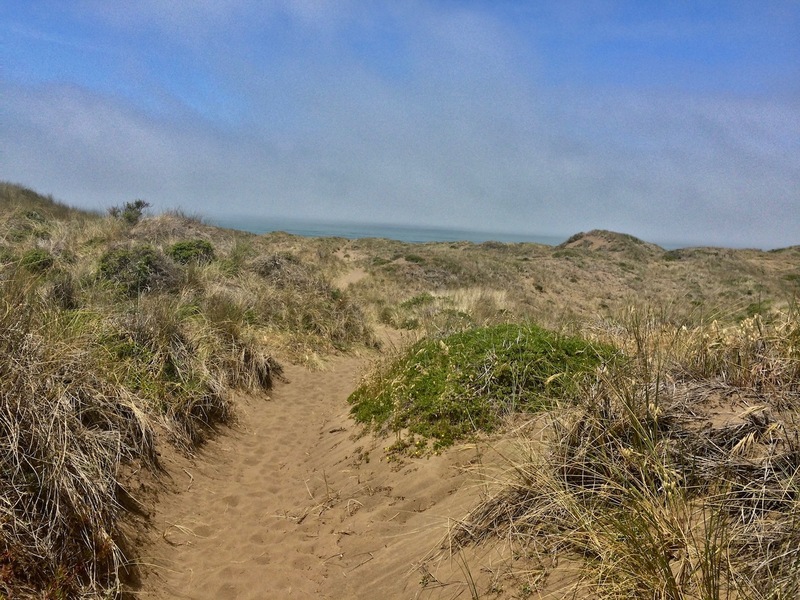 At first the path was on hard packed sand. Soon the path changed to loose beach sand. In the distance was a hill or dune. George and iPhone kept trudging on. It was hard going in that sand. 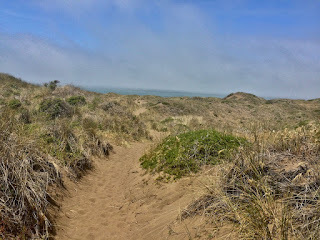 When we came to the top of the hill/dune, we found a second hill/dune ahead of us! When we got to the top that second dune, there was a third dune ahead of us!! At that point we captured a pic of that third dune. And we turned back because we did NOT want to be confronted with yet a fourth dune! We decided to rent a campsite at Albion Campground which is located down in the canyon at the mouth of the Albion River. 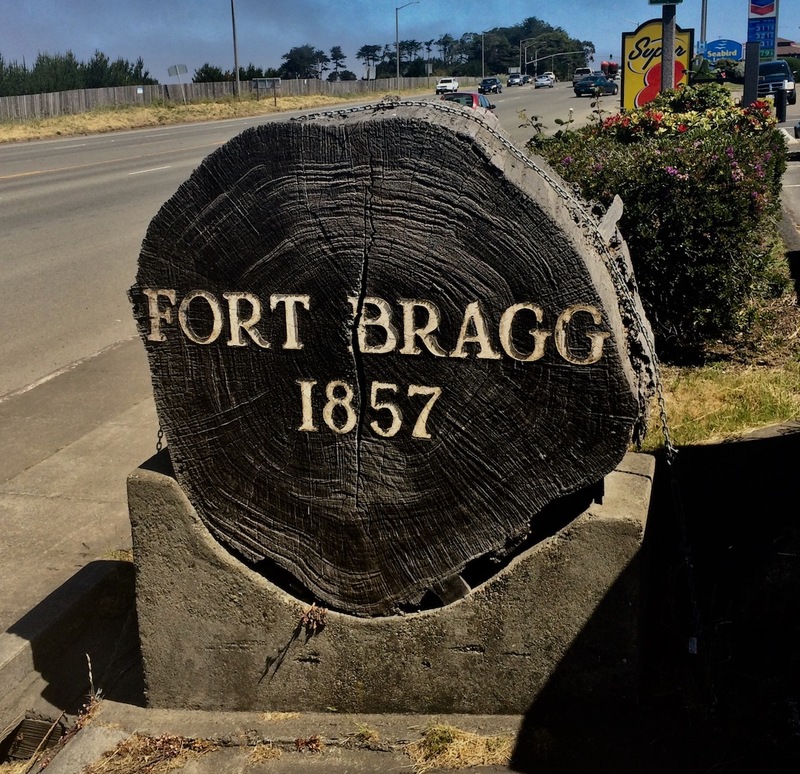 7:30am - Today we are leaving the Porto Bodega RV Park in the Town of Bodega Bay. On the way, Scampy's propane tank should be topped off. Also, we would like to visit the Vons grocery in City of Guerneville. 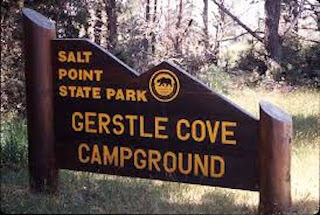 Our next Camp is at Gerstle Cove in Salt Point State Park. Yesterday, our Renogy solar panel was used to charge Scampy's battery. The Renogy charged from 9am to 4pm. Scampy's battery started at 1.225 specific gravity [Fair] and ended at 1.250 specific gravity [Good]. Everybody on the Scampy RV Team is absolutely delighted with Renogy's performance! 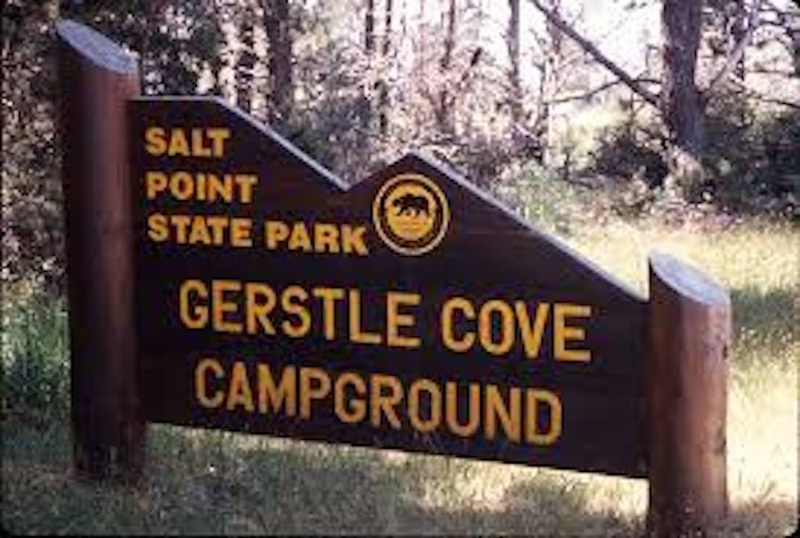 We were very surprised to learn that most of sites at Gerstle Cove are not occupied. We are guessing that as the holiday weekend draws near that the occupancy will zoom. Our Cricket Communications service is not available at Salt Point. However, there is a WiFi access from the ranger station at the Woodside campground across Hwy #1. And that WiFi has no password! It was a bit breezy and chilly earlier this afternoon. Now, that breeze has gone and the temperature is very comfortable. The forest is very beautiful. I just finished eating supper. A patty melt and baked beans. Yummm! The Rhododendron Reserve is very close to where we are camping. For sure tomorrow morning, Little iPhone and George will go there and explore! 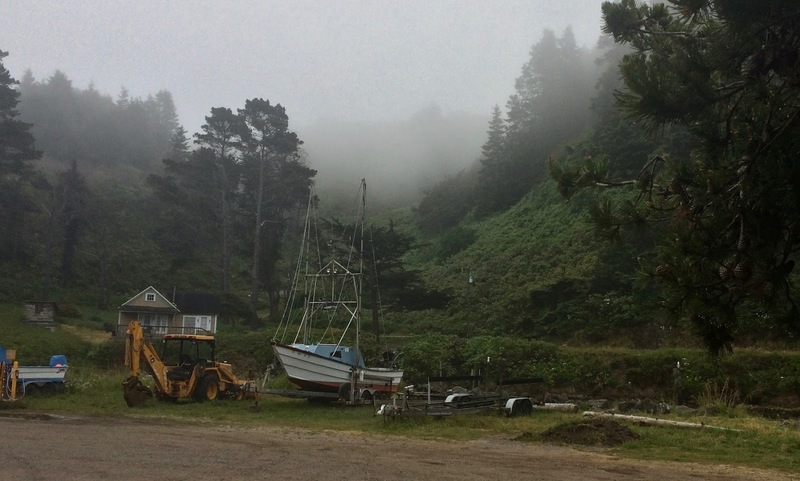 8am - After all of my Blogging about traveling on US 101 instead of State 1, it seems that I've changed my mind. 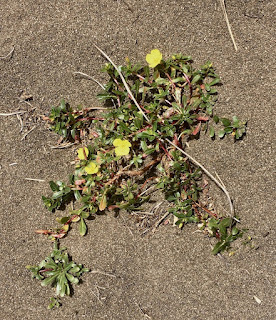 What pulled me in was a website named, "California Revealed" [Link]. Also, I'd not considered paying to camp. Should I give up the North Coast for that? Hmmmm? We are staying at Bodega Bay Marina and RV Park. This place looks familiar. MsTioga and I may have stayed here. It cost $50 bucks for a nite and have booked for two nites. We are in a dry camp site. 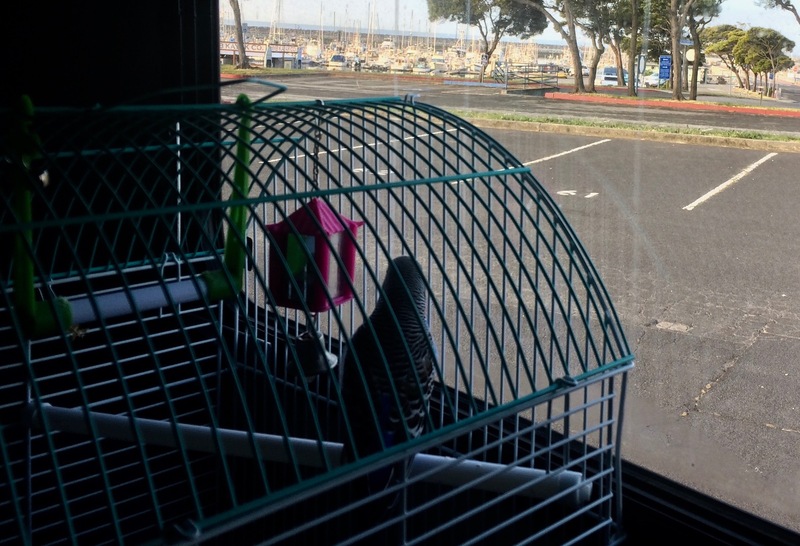 Scampy's rear window has a lovely view of the marina. 12 noon - RV Campgrounds! 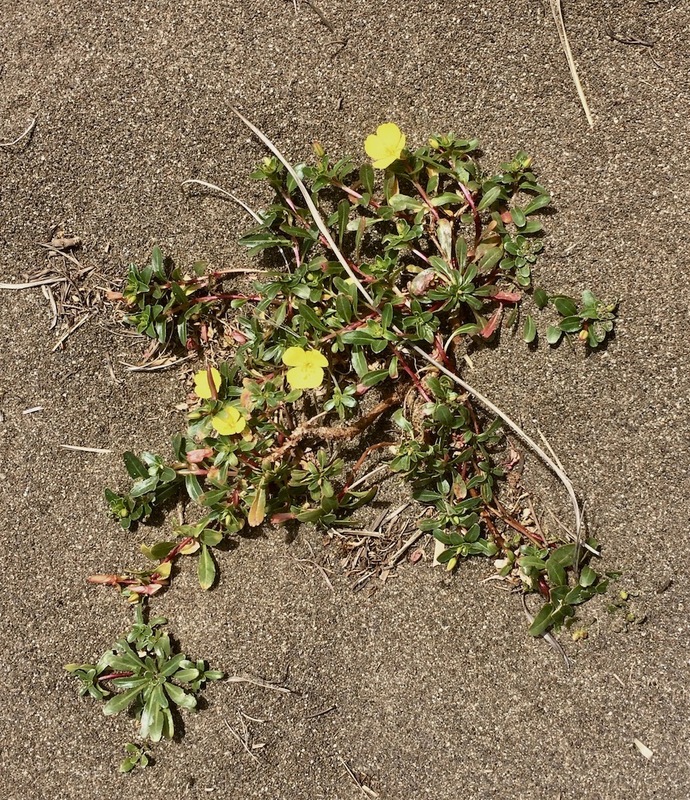 We have made another reservation at Salt Point State Park in the Town of Jenner. This park is only 30 miles north of us. Yet, it is a one hour drive! Going must be slow on Hwy #1. We have never used Scampy's awning before. However, we are now in an RV campground. So, we have set out the awning! Boid and George enjoying the awning's shade! 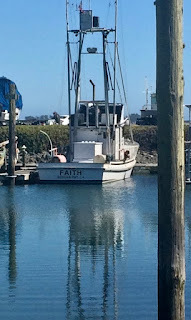 Across the water from Scampy's camp site, is moored a fishing boat. I was sitting outside just watching all the beauty! 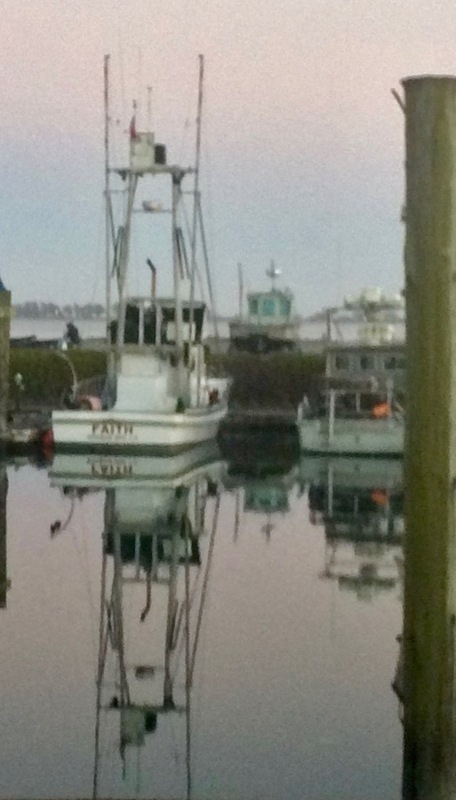 All of a sudden, the breeze died, and the reflection of the fishing boat came clear. The always ready Little iPhone quickly captured the pic. A second later, and the breeze came up. But Little iPhone and I had captured what we wanted! 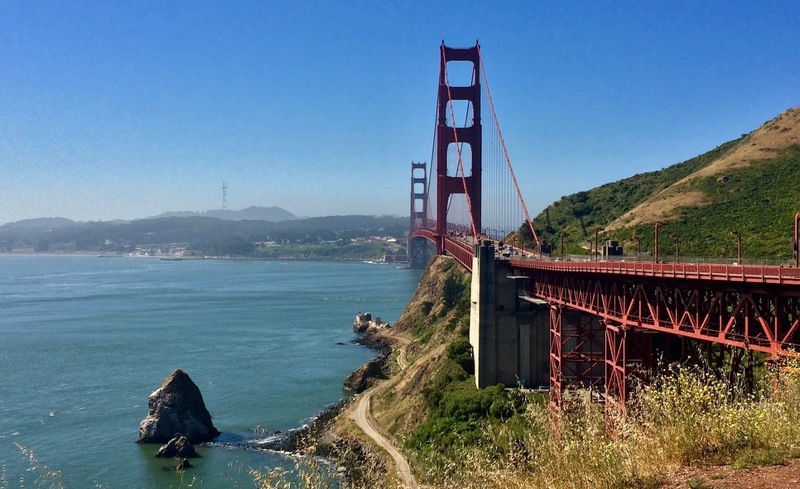 7am - Later today, the Scampy Team will be traveling north of the City of San Francisco. We have a decision to make about this part of our journey. 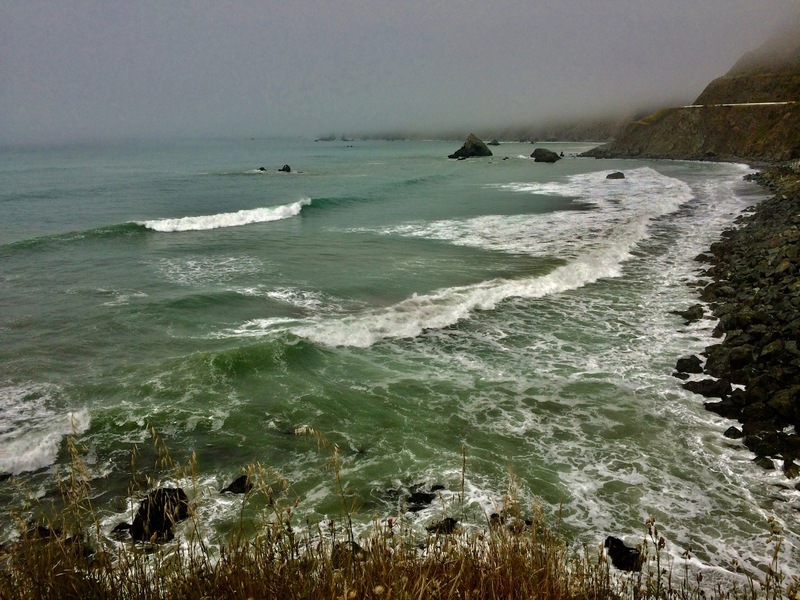 Should we travel along California's gorgeous north coast? 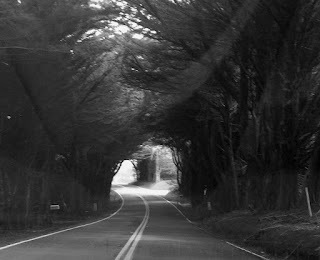 Or inland along Hwy #101? 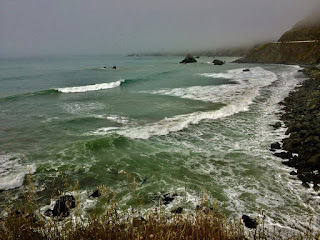 The challenge of Nite Camping along Hwy #1 [the coast route] makes the decision for us. The towns near Hwy #1 are not large enough for the Scampy Team to make our Nite Camps without being detected. So, we shall travel Hwy #101. 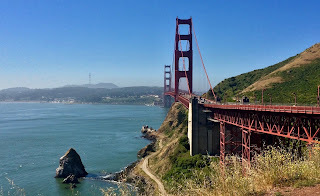 When we crossed the Golden Gate Bridge, iPhone begged for us to pull into the viewing lot so that he could capture some pics! So, we pulled over! Who could resist the pleading of that iPhone guy? We have arrived in the City of Petaluma. There is a 24 Hour Fitness here. Scampy and Honda parked about 1/2 mile away from 24 because there is no parking place for us that is closer. So, George will walk to 24. After all, we are going there to exercise. Not a big deal to get our 1/2 mile of walking on a sidewalk instead of a treadmill. We found our Nite Camp location, and marked it with an App called, "CarFinder." Then we made an Evening Camp in an apartment neighborhood. We may remain in this apartment neighborhood for an hour or so. Then make another Evening Camp in another area. We do this moving around so as not to attract the attention of our neighbors. We will move to our previously selected Nite Camp site around 11pm and leave that site before 6:30am tomorrow. We will finish watching, "Out Of Africa" tonite. It's a long movie and did not finish yesterday before our bedtime [11pm]. "Out Of Africa" is a perfect movie! 7:30am - Last nite an interesting thing happened. Water dripped on to Scampy. But it was not rain water. This water came from the phenomenon of how the redwood trees gather water. It seems that redwood trees adapted to their existence by absorbing mist from the atmosphere. And some of that mist condenses on the upper parts of the redwood trees. That's how the water came to drip on to Scampy! From that condensed mist!! 8:30am - After filling Scampy's fresh water tank with our homemade Water Thief, we headed out of Big Basin Redwood State Park [Link]. 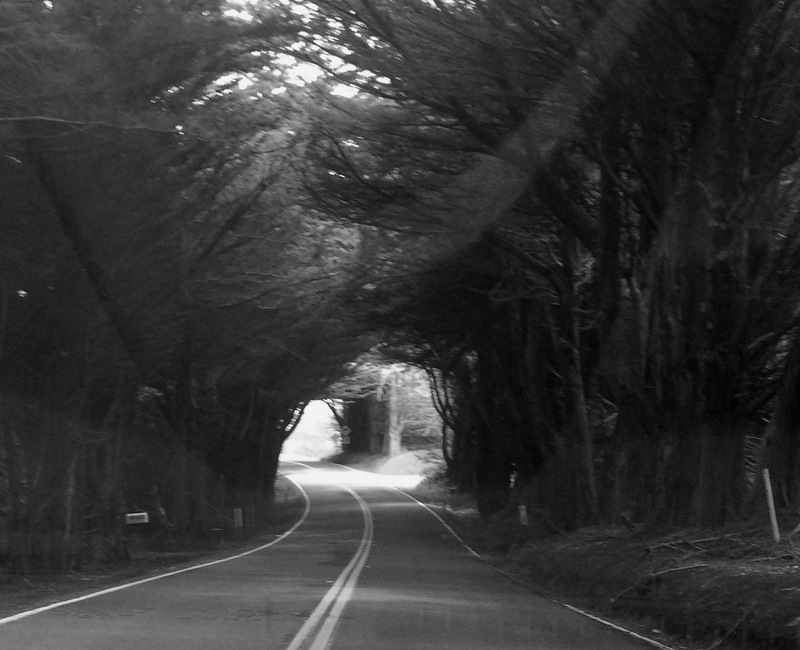 Our destination is Half Moon Bay. 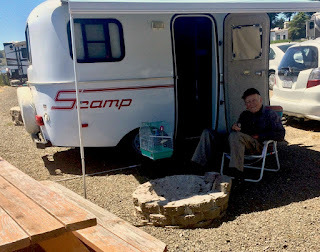 The Scampy Team has arrived at Pillar Point Harbor [Just north of Half Moon Bay] where we had a good time camping in July, 2011 [Link]. However, things have changed a mite since 2011. Now the Harbor Master wants us to have a boat, in order to stay here. So, we will find a different Nite Camp near here. We have found a place next to the Half Moon Bay Airport. Several other RVs are camping here. So, we are joining them and plan to make our Nite Camp here. Here is a stitched pic of the Bay of San Francisco high up on Skyline Drive. We have been doing some experimenting with stitching and editing images. We have returned here to make an Afternoon Camp. It is sooooo beautiful here! We will remain here above the harbor until near sundown. 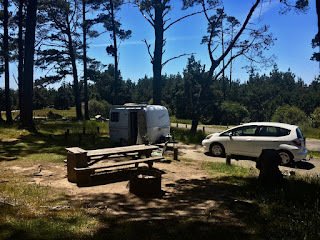 Then return to our Airport Camp that we Blogged to you about above. It appears that I made a mistake in choosing a Nite Camp because there were a bunch of other RVs parked there. I found out about it when a friendly sheriff dropped by to knock on Scampy's door. And I was just beginning to watch the movie, "Out of Africa." Darn! After looking around in a nearby residential neighborhood, a new Nite Camp was chosen [See map link below]. Now, I am able to get back to watching the movie!